Some great music is emerging on either side of the Atlantic where artists draw their creative influences from those roots cousins of folk and country. While we are currently enjoying a fruitful period of US and Canadian visitors expertly practising this craft, it would be remiss to not champion the fine British artists who can give their transatlantic peers a run for their money. 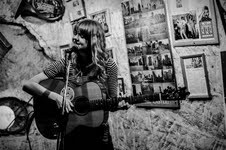 Another name to add to this growing list, if you are not already acquainted, is Norwich based singer-songwriter Jess Morgan. Over the duration of two albums and a newly released EP, Jess has already earned acclaim and a growing list of admirers for a style of acoustic music that successfully blends some traditional elements of music with a rootsy vocal style that drifts the sound westwards. The majestic melodies of Jess’s well constructed original material are sophisticated in content yet uncomplicated in delivery. 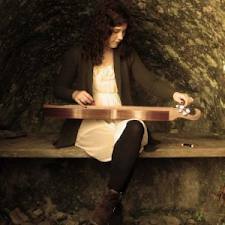 Her appetite to take these songs on the road has led to Jess extensively touring the UK as well as northern Europe and tonight she was the main guest of Stourbridge Folk Club at the musically supportive venue of Katie Fitzgerald’s. Prior to Jess’s two part set, the organiser Sunjay Brayne, himself a singer-songwriter, arranged for local act Kim Lowings and the Greenwood to open with a short slot. In contrast to the sound of Jess which we were to enjoy later, Kim and her three piece band draw most of their influence from the traditional music of these isles with a mixture of old tunes and self penned material that provides a contemporary twist to this heritage. Her vocal delivery and dulcimer playing impressed immensely especially as it blended well with the percussion, violin and acoustic guitar that backed these songs. ‘Phoenix’ and ‘This Life’ were fine examples of her original material while the short set was closed with a rousing version of ‘The Begging Song’ which was well received. From a personal viewpoint, the highlight was when Kim ditched the instruments to give a superb vocal delivery of the fine Be Good Tanyas song ‘The Littlest Birds’. This was a small consolation for the Canadian roots band omitting it from their Coventry set earlier in the year. The diverse sound from Kim’s band proved an ideal contrast to Jess Morgan who relies on the solo delectable accompaniment of an acoustic guitar to play the fruits of her creative talent. This extends into the background story telling that adds so much value to a singer-songwriter’s show. Right from the opening number ‘Travelling Song’ where we discovered the effects of cheap red wine through to ‘The Missionary’ which closed the first set, the natural charm came across well. The latter song was inspired by her travels in Kenya and was given extra promotion as part of Fatea Magazine’s Spring Showcase. My favourite song of the evening came in the first set with the amusing tale of Jess’s tongue in cheek desire for librarians in ‘The Most of All’. This enticing gig from Jess continued in the same manner after a short break with a selection of songs from 2010’s ALL SWELL, 2012’s AYE ME and the new single-take EP recently released and titled RICHER THINNER SMARTER. Amongst these, ‘Talisman’ had a definite traditional folk sound while ‘Well Dressed Fellas’ was more Americana influenced. Throughout listening to these songs you couldn’t help think how much potential there was for a little mandolin, lap steel or dobra to take them to a higher level. By the time the excellent ‘Leave a Light On’ ended the evening as the solitary encore number, the favourable impression of a fine singer-songwriter had left its mark. So appreciation goes to the organisers for bringing Jess Morgan back to the Midlands and for introducing the new talent of Kim Lowings. A final shout out must be made to the ever influential world of Social Media which was the source that led the path to this highly enjoyable evening.